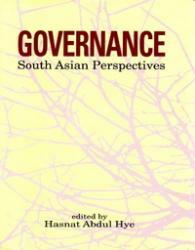 Governance in theory and practice has been the subject of intense discussion and indepth study both in the developed and developing countries for quite sometime. Though improvement in the quality of governance has been slow in coming, there is now a fair degree of agreement over the major issues involved and the reform measures called for. This anthology reflects these issues from the South Asian perspectives based on the experiences of the past and the imperatives of the present. Review of the achievements and failures in various fields of human endeavours becomes specially urgent as well as poignant as humankind enters the new millennium. Governance being the most momentous and extensive enterprise of nations impacting on human welfare and development, claims serious attention of people from all walks of life. The policy prescriptions for good governance assign the task of implementation on all segments of society, formal and informal.